Members of our Board of Trustees include arts, business, and social leaders from Maine, New York, and locations further afield. These dedicated volunteers ensure that the Festival operates to best serve all of its participants and audiences. Elliot Rosen’s family relationship with the Festival goes back to the mid-1970’s when his parents discovered that there was classical music available 15 minutes from their cabin in West Bath. The Festival became an important part of his parents’ summer life in Maine for the next 35 years. Elliot joined the Board in 2011 and was elected Chairman in the 2016 Festival Season. Elliot splits his time between Washington, DC/Maryland, where he has lived and worked most of his adult life, and Maine where he tries to come as often as possible. Elliot is a serial arts organization board member. Before joining the Festival Board he was a long time member and Board Chair of the Liz Lerman Dance Exchange, a contemporary dance company. Elliot is a beginner-beginner cellist although certain Kaplan Fellows have kindly told him that he is a “no excuses accepted” cellist. After returning from a three-year expat stint in Moscow, Russia, Lorna and her husband moved to Harpswell, Maine. Prior to Russia, Lorna ran the New York office of a Los Angeles literary agency and later was the Director of Education for a sexual assault crisis center in Connecticut. No matter where she lived, Lorna has taken advantage of the available musical offerings, from the accessible NY Philharmonic and Julliard String Quartet, to the Moscow Chamber Orchestra, to the local high school orchestra. At the same time, Lorna volunteered at nonprofits in the communities she lived, even in Moscow where she helped the local domestic violence agency. When she settled in Maine, Lorna subscribed to the Festival and soon after volunteered in the admissions office. For the past sixteen years, Lorna has evaluated financial aid applications and helped with student housing. When the time was right, Lorna accepted nomination to the Festival Board of Trustees. You can find Lorna and her husband at every Festival concert during the summer, as well as at most of the masterclasses and lectures. Lorna loves seeing the Festival branch out in new directions and knows she’s not the only one because of the exponential growth of student applications over the past few years. Peter Griffin retired to the Cundys Harbor area of Harpswell in 2006 after a thirty-year career at a privately-owned global commodity merchant and trading company. He served his final eight years as President of its North American operations. Earlier, Peter served three years as Instructor in Economics at Washington’s Whitman College and five years as an employee of a large accounting firm in New York. Peter is a graduate of Dartmouth College and the Stanford Graduate School of Business. He also serves on the boards of the Holbrook Community Foundation in Cundys Harbor and the Friends of the Kotzschmar Organ in Portland. He is an amateur pipe organist. Jan Williams comes from a musical family. His grandfather Jan A. Williams played clarinet in Sousa’s Band as a young teenager, went on to Principle clarinet chairs at The Metropolitan Opera, The New York Philharmonic under Walter Damrosch, and the NBC Symphony under Arturo Toscanini. Jan A.’s brother, Ernest, was a trumpeter with the Philadelphia Orchestra. Jan’s father was a Juilliard graduate, played in the Radio City Music Hall orchestra, and taught music for all of the years Jan remembers. Jan recently retired from a career in Business Consulting. His field was business process improvement, both in finance and operations. His specialty is in identifying best practices and capabilities in one industry or context and transferring those practices to new organizations and situations. Jan has built and managed consulting organizations for several firms, including Price Waterhouse in Madrid, Grant Thornton in Boston, and Gunn Partners in Melbourne, Australia. Jan is Chairman of the Town of Hiram Planning Board. He also is Treasurer and Executive Board Member of the Southern Maine Regional Planning Commission, and serves on the loan committee of the Saco & Biddeford Economic Development Corporation. Among numerous hobbies, Jan enjoys distance running, and working on his extensive toy train layout. Classical music has been ever present in Bob’s life. Born and raised in Philadelphia, Bob lived steps from the Curtis Institute of Music where his father, Iso, graduated and then embarked on a solo violin career. Bob studied violin and piano for many years, but ultimately decided to pursue science and technology, earning Chemistry and Engineering degrees from MIT. Upon graduation, Bob began a career entirely with the DuPont Company, developing new environmentally-friendly paints for autos. Later in a business-improvement capacity, he advised or led teams in marketing, strategy, and customer quality assurance as a Senior Consultant. In retirement, Bob volunteers with community non-profits tackling food insecurity and homelessness, as well as nature preservation and child development. When not volunteering, Bob enjoys traveling, hiking, and playing bridge. He and his wife, Carol, a professional violist, have enjoyed summers in West Bath since 2013. A subscriber to The New Yorker from age 13, this California native knew that NYC was where she wanted to be and, after graduation from the University of Southern California and graduate work at Stanford, that was where she went. Working an entire career in publishing, beginning with…The New Yorker…yes! Then came travel magazines and being in at the creation of Bon Appetit as Managing Editor, remaking Cuisine magazine as Editor in Chief, editing books on food, wine and entertaining at HarperCollins, and lots of freelance writing for newspapers and magazines. 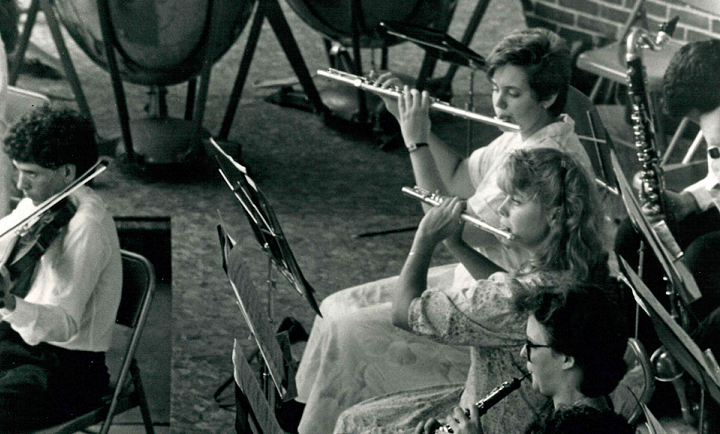 When she landed in Maine in retirement, the Bowdoin International Music Festival and its talented students have been the major, and deeply rewarding, focus of volunteer life. For twelve years, Margy served as Director of Development at Cape Cod Academy, a K-12 independent day school in Osterville, MA when she semi-retired, she became a self-employed organizational specialist and a wedding consultant for eight years. She was a contributing writer for Cape Cod Travel magazine and freelanced for various Cape newspapers. Then she really retired to Brunswick after living on Cape Cod for thirty years. An Ohioan by birth, she was raised in Cleveland and graduated from Baldwin Wallace College. She served on the Vestry of Trinity Cathedral, Cleveland and at St. Christopher’s Church in Chatham, MA where she was Junior Warden and established the Food Pantry there, which still exists. She was a season subscriber to the Boston Symphony Orchestra. Since moving to Brunswick in 2007 she has been a season subscriber to the Portland Symphony, BIMF and to MSMT, on whose Board she also serves. She was president of her condominium association for four years and for the same number of years chaired the Mid Coast Hospital annual Yard Sale, raising funds for health career scholarships. Margy’s interest in classical music began when she attended Cleveland Orchestra concerts under the baton of the late George Szell, and the old traveling performances of the Metropolitan Opera. She had an “Auntie Mame” in New York City whose annual itineraries included attending concerts of the New York Philharmonic, the Metropolitan Opera (first at the old opera house and then at Lincoln Center) and in later years long weekends at Tanglewood every summer for twenty years. Auntie Mame would have loved BIMF as much as Margy does. Before he retired in 2012, Rol was senior vice-president of Supply Chain at L.L. Bean, Inc. where he worked since 1982. Prior to living in Maine, he lived in Africa for several years. Rol has served on local, state, national, and industry boards. In 1989 he took an extended sabbatical from L.L. Bean to work on state and national initiatives to improve math and science education in public schools. During that time he implemented a $10 million National Science Foundation grant for the state of Maine. He served on the National Alliance for Math and Science Education and on the executive committee of the Maine Math and Science Alliance. Rol is a former member of the Town of Brunswick planning board, is on the board of Mid Coast Health Services, and is a past president of the Bowdoin International Music Festival, on whose board he has served in many capacities since 1998. He is currently chairman of the board of the Appalachian Mountain Club. Beatrice Francais has had a long career in education, including student exchange, teaching mathematics, and school administration. From 1996-1999 she served on the Board of Trustees of The Brearley School in New York City. From 2001-2003 she served as a Volunteer for the Special Music School of America (Public Elementary School for musically gifted students in New York City). She is currently Chair of the Website Committee at the Cosmopolitan Club of New York City and is on the Board of ACMP (Associated Chamber Music Players) – the chamber music network. She is also on the Board of Young Concert Artists and serves on the Visiting Committee for the Musical Instruments Department at the Metropolitan Museum. Beatrice is an amateur violinist and plays chamber music on a regular basis. Dr. Bernard Givertz is a retired cardiologist, the founder of Maine Cardiology Associates and of Cardiovascular Consultants of Maine. He was Assistant Clinical Professor of Medicine at the University of Vermont Medical School and President of the Maine Heart Association. Bernard was a member of the Boards of Temple Beth El and the Southern Maine Jewish Community Alliance; he serves on the Boards of the Portland Conservatory of Music, and Cedars Nursing and Senior Citizens complex, including The Atrium and The Osher Inn. He is a devoted supporter of classical music, and plays the clarinet. Ian is a consultant living in New York City, specializing in marketing and strategy. He is an alumnus of Vassar College (BA, Music, honors) and Syracuse University (MM, Music Composition and Theory, honors), as well as the Bowdoin International Music Festival (’09). After working in fundraising for Jazz at Lincoln Center, he transitioned to a career in marketing, working at Tribal Worldwide, McCann Erickson, and others. He is currently a consultant to a variety of businesses in the development, financial services, lifestyle, and healthcare spaces. In addition to marketing work, Ian continues to play and record music with various bands and by himself. Other interests include cooking, tennis, golf and photography. Sam Hayward has been the founding chef and a co-owner of Fore Street restaurant in Portland, Maine, since its opening in 1996. He’s also a co-owner of Scales on Maine Wharf, just opened on Portland’s waterfront. Sam studied double-bass and choral music performance in college, but found his vocation cooking and presenting the foods of Maine at 22 Lincoln Restaurant in Brunswick and the Harraseeket Inn in Freeport before collaborating in the creation of Fore Street and Scales. Sam is the first Maine recipient of the James Beard Foundation award for Best Chef – Northeast in 2004. Sam has served on the Board of Trustees of the Bowdoin International Music Festival since 1991. Susan and Spencer Lavan moved their young family to Maine in the summer of 1976 and Spencer almost immediately discovered the Festival. From that moment on the Festival became an important part of Susan and Spencer’s lives. The importance of the Festival became obvious when Susan became a board member, a position she maintained until the family moved to Chicago in 1988. Spencer and Susan continued to attend concerts during their summers in Maine but Susan’s involvement with the Festival took on new dimension when she and her husband permanently relocated to Maine in 1996. Since then Susan has been an active volunteer and has contributed her time and energy in many ways that have benefited the Festival. Susan’s volunteering has not been limited to the Bowdoin International Music Festival, she has also given time to civil rights causes and she has worked with elementary aged children. When she is not volunteering or spending time with her family and friends, she enjoys cooking, knitting, and gardening. Susan was named an emeritus trustee in 2014 and at the request of the board rejoined the board as a regular member in 2016. Kent Mitchell and his wife Natalie began spending summers in Maine in 2004 after retiring from ownership of a lamp manufacturing business in Vermont. As they were getting familiar with the area, they went to a few Festival concerts and soon became enthusiastic attendees of faculty and student concerts as well as masterclasses. What is most exciting to Kent is the “learning” that one sees occurring on the stage during a masterclass. Kent is a graduate of DePauw University and the University of Chicago Graduate School of Business. He was a member of the Vermont Business Roundtable for 15 years, serving on its board for six years. In Vermont, Kent enjoys singing in a church choir and a community chorus and delivering for Meals on Wheels. He loves harvesting firewood and sawlogs on his home property, and spending time with his family, especially his two grandchildren. James T. Morgan was a long-time colleague of the late Sarah Caldwell, one of the most innovative opera directors of her time and the first woman to conduct at the Metropolitan Opera. In addition to various administrative positions at the Opera Company of Boston, he worked with Ms. Caldwell on projects and festivals in the Philippines, Russia, China, and Wolf Trap near Washington, DC. Jim moved to Maine in 1999 and became Director of Development and Marketing for PCA Great Performances, now known as Portland Ovations. He now sits on its board as vice president as well as the board of the Bowdoin International Music Festival, having served as chair from 2010 to 2014. Daniel Nitsch became Executive Director of the Festival in 2016 after joining the organization as Director of Admissions and Operations in 2015. Together with the staff and faculty, Nitsch created and executed a recruitment plan that brought more applications than ever before in the 53-year history of the Festival. Prior to this appointment, Nitsch served as operations manager for Yellow Barn Music Festival. Nitsch has worked for various arts organizations including the Cleveland Orchestra, Music@Menlo, American Bach Soloists, and the Oberlin Artist Recital Series. In addition to posts in arts management, Nitsch has held the position of assistant conductor of the Northern Ohio Youth Orchestra and performed as both a soloist and in ensembles. Nitsch is a graduate of the Oberlin Conservatory of Music. For nearly 25 years, Herbert was President and CEO of Mid Coast Health Services and Mid Coast Hospital and its subsidiaries, including Mid Coast Geriatric Services, Community Health and Nursing Services, Thornton Oaks Retirement Community, and Mid Coast Medical Group. He was the Administrator of Regional Memorial Hospital from 1978 to 1987. Previously, he worked at Yale-New Haven Hospital (New Haven, Connecticut) from 1961-1978 as Administrative Assistant, Assistant Director and Associate Director and, concurrently with being Associate Director at the hospital, was Director of Ambulatory Services at Yale New Haven Medical Center. Herbert has held many local, state, and national appointments and has served or currently serves as a member of the Board of Directors of the Portland Symphony Orchestra, Board of Directors of the Bowdoin International Music Festival, Chairman of the Board of the Center for the Arts of the Chocolate Church Arts Center, Trustee of Brandeis University and Chairman of the Board of the United Way and Board of Directors of Medical Mutual Insurance Company of Maine. He currently serves as the Chairman of the Board of Trustees of the Bigelow Laboratory for Ocean Sciences. Herbert has also been a member of the faculty at Yale University School of Medicine, has been honored at Yale by being named a fellow of Berkeley College, and is currently a Fellow of Brandeis University. He has frequently spoken, nationally and internationally, on issues related to healthcare. Hugh Phelps was a radiation oncologist for 30 years at Maine Med and CMMC in Lewiston until retiring in 2003. He served on the Freeport School Committee and Town Council in the 1980’s. He has been on the Bowdoin International Music Festival board since the early 1990’s, including a stint as board chair. Hugh sings regularly with the Bowdoin College chorus and Rachmaninoff chorus and has sung in the past with the Choral Arts Society and Oratorio Chorale. He currently also serves on board of the Pine Tree Society. Norman Rapkin moved to Portland a few years ago, and has since become involved with music and healthcare organizations, including serving on the boards of the Portland Symphony Orchestra and the Portland Chamber Music Festival. Prior to moving to Maine, Norman had a long career in Montreal, Canada, in law and banking, specializing in taxation. He served as a consultant with Heenan Blaikie from 1994-1998, prior to which he was a vice president of The Royal Bank of Canada (1980-1990); partner in P.S. Ross & Partners, Montreal, QC (1967-1980) and principal of Touche Ross & Co., Montreal, QC. (1967-1980). Bill Rogers received his B.A. Degree from Harvard College and his J.D. Degree from Harvard Law School. He has retired as Senior Partner of the law firm of Rogers and Greenberg, LLP in Dayton, Ohio. Bill serves as a member and past Chair of the Board of Trustees of the Bowdoin International Music Festival and served as the Chair of the Board of Trustees of the Maine Maritime Museum in Bath. He is a member of the Dayton Bar Association (Past President), the Ohio and American Bar Associations, and a Life Fellow of both the American Bar Foundation and the Ohio Bar Foundation. After graduating from Mount Holyoke College, Claudia Spies worked in academic administration, first at the University of Maine in Farmington, then at Harvard University, after receiving an Ed.M at the Harvard Graduate School of Education. Moving to NYC, she worked in account management at the advertising agencies Benton and Bowles and Ogilvy and Mather. Having lived in Europe for 25 years, first in Berlin, Germany and then London, England, Claudia and her husband, Michael now reside in New York City. Claudia grew up in Brunswick, and now enjoys spending the summers with her husband and two sons in Harpswell. Dominique van de Stadt worked in journalism (World Press Review, The Wall Street Transcript, Harper’s Magazine); publishing (Williams and Wilkins, Waverly Press); public relations (Johns Hopkins Health Systems) and translation services (Oxfam, Berlitz, Translingua) for 15 years after finishing her studies. Subsequently she became a dedicated community volunteer while raising four children, Milena, Adrian, Stefan and Flavia, with her husband, Octavio Pajaro. She has enjoyed the privilege of serving on the boards and special committees of schools and non-profit music organizations in Florida (Jacksonville Country Day School, Episcopal High School, Jacksonville Symphony, Jacksonville Symphony Youth Orchestra, Ritz Chamber Players); Alabama (Alabama Symphony, Alabama Symphony Youth Orchestra, Scrollworks, Harvard Interviewing Committee, The Altamont School) and Arizona (Red Rocks Music Festival, Phoenix Youth Symphony, Harvard Interviewing Committee, MusicaNova Orchestra, Phoenix Ivy Council). She has also served on the parent committees of the Sphinx Organization in Detroit and The Curtis Institute of Music in Philadelphia. She is one of many parents happy to have served as a “team advisor” for Amy Nathan’s book, The Music Parents’ Survival Guide. A dual Dutch and U.S. citizen, Dominique grew up in Brazil, Angola, Argentina, Turkey and various European countries before coming to the US. She received a BA in History and Literature from Harvard and an MS in Journalism from Columbia. Bowdoin International Music Festival has been Dominique’s favorite music festival for many years, as three of the Pajaro-van de Stadt children have attended, loved, and benefitted from the Festival for the past 10 years: Milena, violin and viola—currently violist with the Dover Quartet; Stefan, guitar—currently pursuing a singer-songwriter degree at the LA College of Music; Flavia, violin—currently a student at the Peabody Conservatory. David Ying concertizes widely, both in traditional performances from Carnegie Hall to the Sydney Opera House, and in unusual presentations beyond the concert hall. Cellist of the Grammy Award-winning Ying Quartet, the Quartet’s wide-ranging career and interests have led them to the White House as well as to juvenile prisons, and from farm towns to urban community centers. Their performing collaborators range from eminent musicians such as pianist Menahem Pressler, to folk musician Mike Seeger, to dancers, actors, magicians, computers and even Chinese chefs. Mr. Ying can also be heard on the Ying Quartet’s enthusiastically received recordings. As solo cellist, he has been prizewinner in the Naumburg International Violincello Competition and the Washington International Competition. Mr. Ying has also been active as a recitalist with his wife, pianist Elinor Freer, and together they directed the Skaneateles Festival. David Ying is the Artistic Director of the Bowdoin International Music Festival. Phillip Ying performs regularly across the United States, Europe, and Asia. He recently won a Grammy Award for his work with the Ying and Turtle Island String Quartets, and is a recipient of the Naumburg Award for chamber music. Mr. Ying has also been presented numerous times in recital and as a soloist with orchestras. With the Ying Quartet, he maintains a vital interest in new music. He has been recorded by Telarc, Quartz, EMI, Albany, and Elektra. Phillip Ying is the Artistic Director of the Bowdoin International Music Festival.